Jennifer Duran, RN, hopes her experience as a Mass General Global Nursing fellow in Uganda is the start of a long collaboration. Jennifer Duran, RN, knew she wanted to care for sick children from a young age after witnessing compassionate nurses caring for her sick brother. 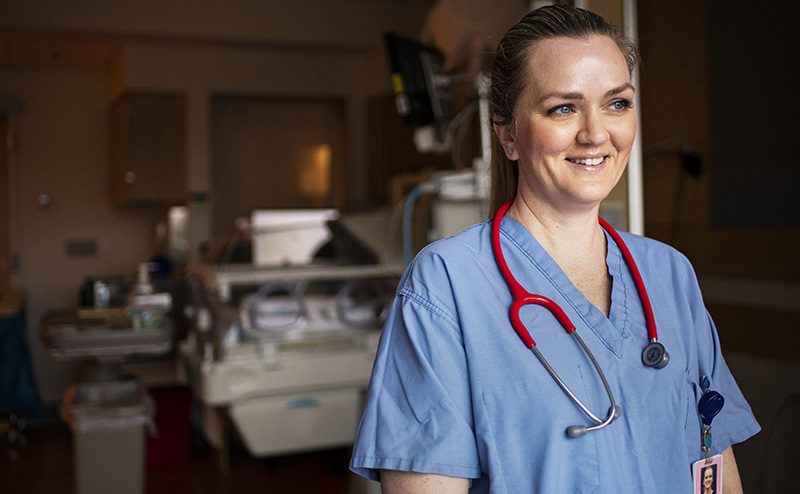 Now a registered nurse in the Neonatal Intensive Care Unit (NICU) at Massachusetts General Hospital, Ms. Duran gets to carry out her childhood dream on a daily basis and recently had an opportunity to do so halfway around the globe. As a recipient of a Mass General Global Nursing Fellowship through the Center for Global Health, Duran recently spent 18 days teaching and training with nurses, students, midwives and residents in the Mbarara Regional Referral Hospital (MRRH) NICU in Uganda. “This was a dynamic group of learners eager for professional development, so the energy was powerful,” she said. Each morning Ms. Duran would teach a classroom course on topics she and the students thought would be helpful. They would then join medical rounds in the NICU for a more hands-on experience. “The rounding process became a lively discussion at each bedside,” she said. Ms. Duran credits Pat Daoust, RN, MSN, FAAN, director of Nursing for Global Health and Mary Sebert, RN, MPH, International Nurse Program manager, with providing thorough preparation for a successful trip. The team had Ms. Duran read required books, take a safety and security course and engage in multiple meetings. “Mary had a comprehensive one-on-one presentation to review cultural awareness, expectations of the fellowship as well as information on how to prepare myself not only professionally but emotionally,” she said. Originating in 2016, the Global Nursing Fellowship offers short-term opportunities for Mass General nurses to provide didactic instruction and clinical mentorship based on requests for specific clinical expertise from long-term partners. Supported by the Sullivan Family Foundation and the Wyss Medical Foundation, the fellowship has sent 23 nurses specializing in oncology, pediatrics, substance use disorder and other disciplines to multiple locations in resource-limited settings to work towards shared goals of improving patient care. Despite returning to Boston, Ms. Duran is still engaging with her new colleagues in Mbarara. She is planning monthly video conferences with one of the NICU nurses, Bashira Haith, to discuss the progress of the projects they implemented, ongoing educational needs and any challenges that may arise. Duran is also preparing monthly educational lectures that the nurses can present to each other. To learn how you can support the Mass General Center for Global Health, please contact us. This story was first published on the Mass General Center for Global Health’s website.